The words of Willie Wonka come to mind as you wander the dozen plus fanciful, sugar-filled rooms of Candytopia. 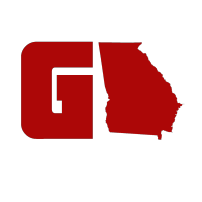 The interactive installation, which has drawn sold-out crowds in New York and San Francisco (including A-listers like Wiz Khalifa and Drew Barrymore), just opened in Atlanta this weekend. Each room is carefully themed, from steampunk to underwater worlds. In some, you can press giant flowers to smell sweet, nostalgic scents. 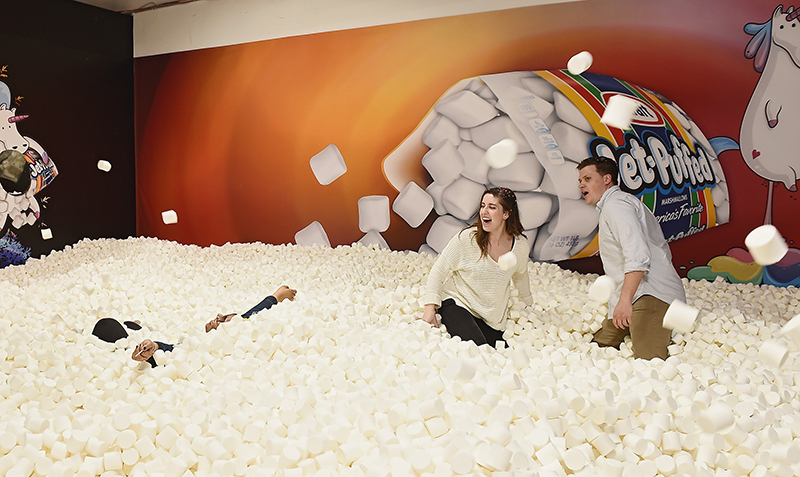 In others, you can swing, pose for photos and jump in a giant pit of marshmallows. (Disclosure: Marshmallows look like marshmallows and feel like marshmallows but are not actually marshmallows.) Quotes like Wonka’s above and others are emblazoned on the wall. Rainbows, imaginary creatures, bright colors and a general air of frivolity pervade the atmosphere. This is your candy-filled dreams come to life. 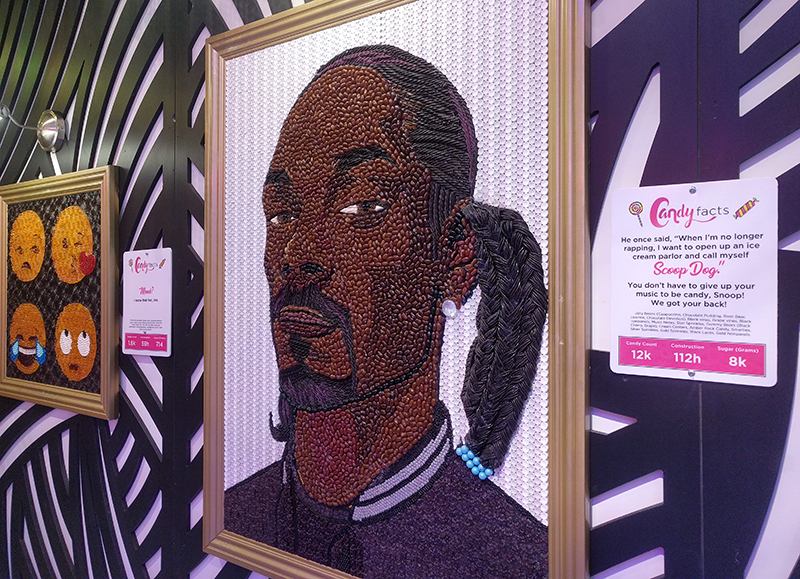 The highlight, though, has to be the fabulously elaborate candy art. Take the first piece you encounter, for example. 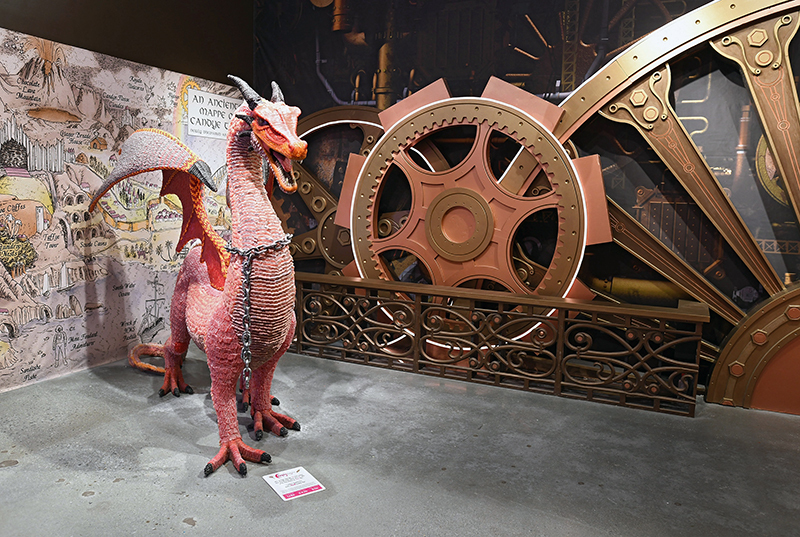 It’s a dragon made of 125,000 pieces of candy, its wings weighing 75 pounds each and its body, built from gummies, licorice, rock candy and more, comes in at 250 pounds. 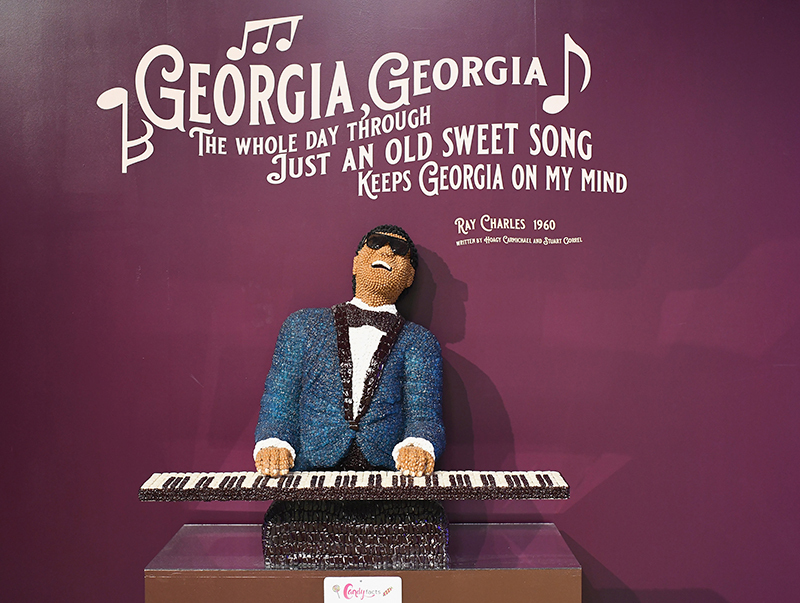 A nice touch, the Atlanta version of Candytopia makes a nod to local pop culture (in candy, of course) with tributes to Ray Charles, our state fruit and other Georgia icons. And to answer the most important question — yes, the exhibit is filled with candy for you to enjoy. Sometimes the samples are artfully displayed on a disc suspended from the ceiling. 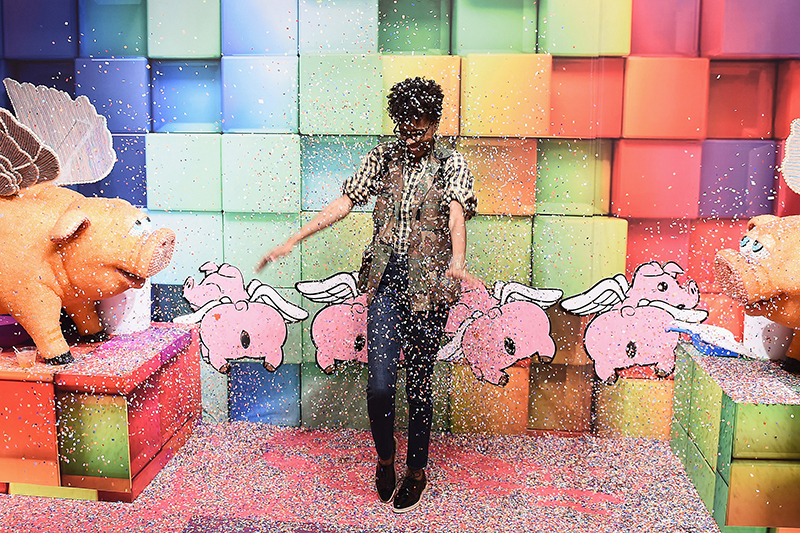 Sometimes they’re in giant bins surrounded by confetti-spraying winged candy pigs. The important part is that you can take at least one from each, though you probably shouldn’t eat all there — you could, but you shouldn’t. I heard the owner, a world-famous candy artist, has dreams of expanding Candytopia to a full-scale theme park. Think of it, candy as far as the eye can see! Until then (or actually, until June 2), Candytopia is here in Atlanta to let you taste a world of purely sweet imagination. 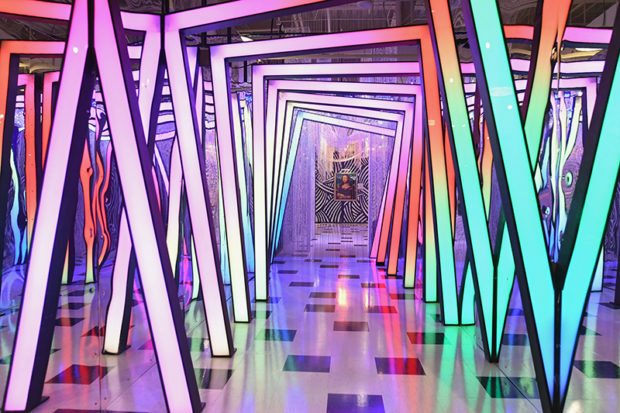 Candytopia is open at EDENS Lenox Marketplace (3535 Peachtree Road NE) in Buckhead through June 2. Parking is free. Go the second level of the parking deck and look for the Candytopia sign. 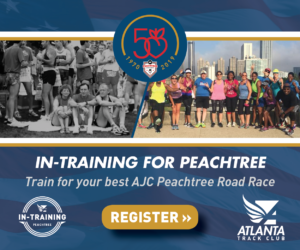 Tickets, which are expected to sell out, are $28 for adults and $20 for kids ages 4-12 and can be purchased online. Make sure to arrive early for your time slot. And don’t forget your camera!